To construct a confidence interval for a single unknown population mean μ, where the population standard deviation is known, we need as an estimate for μ and we need the margin of error. Here, the margin of error (EBM) is called the error bound for a population mean (abbreviated EBM). The sample mean is the point estimate of the unknown population mean μ. 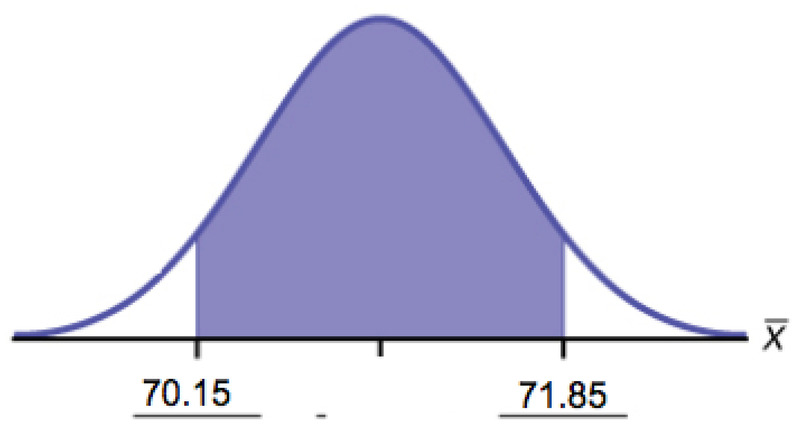 A confidence interval for a population mean with a known standard deviation is based on the fact that the sample means follow an approximately normal distribution. Suppose that our sample has a mean of = 10, and we have constructed the 90% confidence interval (5, 15) where EBM = 5.
is normally distributed, that is, ~ N .
The confidence level, CL, is the area in the middle of the standard normal distribution. CL = 1 – α, so α is the area that is split equally between the two tails. Each of the tails contains an area equal to . The z-score that has an area to the right of is denoted by . For example, when CL = 0.95, α = 0.05 and = 0.025; we write = z0.025. , using a calculator, computer or a standard normal probability table. CL + + = CL + α = 1. Solution ATo find the confidence interval, you need the sample mean, , and the EBM. To find the 98% confidence interval, find . σ = 3; The confidence level is 90% (CL=0.90); = z0.05 = 1.645. When n = 100: EBM = = (1.645) = 0.4935. When n = 25: EBM = = (1.645) = 0.987. If we don’t know the sample mean: EBM = = 0.82. If we don’t know the error bound: = = 68. The formula for sample size is n = , found by solving the error bound formula for n.
n = = = 216.09 using the sample size equation. 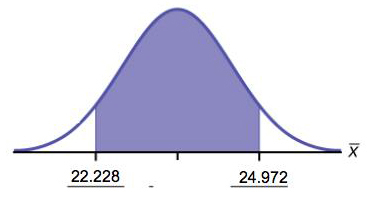 The distribution of sample means is normally distributed with mean equal to the population mean and standard deviation given by the population standard deviation divided by the square root of the sample size. = the z-score with the property that the area to the right of the z-score is this is the z-score used in the calculation of “EBM where α = 1 – CL. The confidence interval has the format ( − EBM, + EBM). In words, define the random variables X and . X is the time in minutes it takes to complete the U.S. Census short form. is the mean time it took a sample of 200 people to complete the U.S. Census short form. In words, define the random variable . is the mean weight of a sample of 20 heads of lettuce. X is the time needed to complete an individual tax form. is the mean time to complete tax forms from a sample of 100 customers. Define the random variables X and in words. X is the number of letters a single camper will send home. is the mean number of letters sent home from a sample of 20 campers. The Federal Election Commission collects information about campaign contributions and disbursements for candidates and political committees each election cycle. During the 2012 campaign season, there were 1,619 candidates for the House of Representatives across the United States who received contributions from individuals. [link] shows the total receipts from individuals for a random selection of 40 House candidates rounded to the nearest 100. The standard deviation for this data to the nearest hundred is σ = 909,200. The confidence interval is (287,114, 850,632). We estimate with 95% confidence that the mean amount of contributions received from all individuals by House candidates is between 287,109 and 850,637. The American Community Survey (ACS), part of the United States Census Bureau, conducts a yearly census similar to the one taken every ten years, but with a smaller percentage of participants. The most recent survey estimates with 90% confidence that the mean household income in the U.S. falls between 69,720 and 69,922. Find the point estimate for mean U.S. household income and the error bound for mean U.S. household income. the percent expression for the probability that the confidence interval contains the true population parameter; for example, if the CL = 90%, then in 90 out of 100 samples the interval estimate will enclose the true population parameter. the margin of error; depends on the confidence level, sample size, and known or estimated population standard deviation. A Single Population Mean using the Normal Distribution by OpenStaxCollege is licensed under a Creative Commons Attribution 4.0 International License, except where otherwise noted.